Know Maria Class of 1965 graduates that are NOT on this List? Help us Update the 1965 Class List by adding missing names. For more information, including online registration, click here. EARLY REGISTRATION DEADLINE IS APPROACHING! REGISTER TODAY TO RECEIVE THE DISCOUNTED PRICE OF $40. After March 27, the cost will be $50. "Reunion 2015" will honor classes whose graduation year ends in '0' or '5.' Class Coordinators are hard at work contacting their classmates, updating their contact information, and encouraging their attendance at the reunion. If you haven't been contacted yet, and want to be put in touch with your Class Coordinator, please send your name, email address and/or phone number to *****@mariakaupascenter.com, or call (773) 925-XXXX ext. 7. 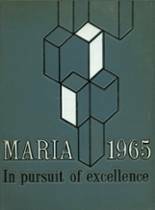 More 1965 alumni from Maria HS have posted profiles on Classmates.com®. Click here to register for free at Classmates.com® and view other 1965 alumni. Missing some friends from Maria that graduated with you in 1965? Check the list below that shows the Maria class of '65. If you are a Maria alumn, we encourage you to register and be sure to sign up for the alumni newsletter.